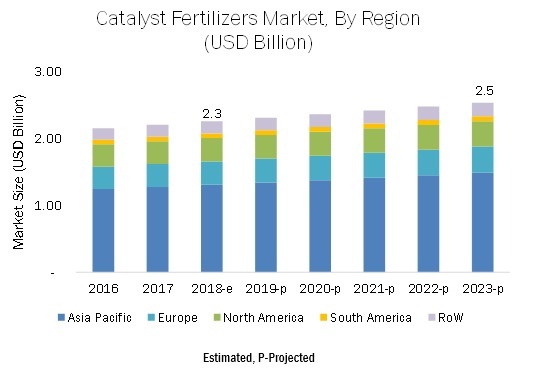 [133 Pages Report] The catalyst fertilizers market is estimated to account for USD 2.3 billion in 2018 and is projected to reach USD 2.5 billion by 2023, at a CAGR of 2.36% during the forecast period. The market is primarily driven by growth in the production of fertilizers and expansion of production facilities in Asia. Also, with the increase in greenhouse gas emissions from ammonia plants, innovations in the catalyst industry to control emissions through selective catalytic reduction technology are projected to drive the growth of the market over the next five years. On the basis of fertilizer production process, the Haber-Bosch segment is projected to witness the fastest growth during the forecast period. Ammonia is one of the largest inorganic chemical produced across the globe through the Haber-Bosch process, developed first by BASF. The Haber-Bosch process is based on catalytic reactions, and hence, the conversion rate has been high for this process. According to the estimates by USGS, global production is expected to continue to grow 3%-5% annually due to the increasing fertilizer demand. Apart from Haber-Bosch, owing to the increasing emissions of NOX and N2O into the environment from ammonia production, emission controlling catalysts have also been developed and are increasingly adopted in conjunction with synthesis catalysts. Thus, this process is projected to witness a comparatively fast growth during the forecast period. On the basis of metal group, base metals are projected to witness the fastest growth in the market during the forecast period. Catalysts are metal or organometallic compounds and are extensively used in refinery and fertilizer applications. Key players such as Clariant International (Switzerland), Johnson Matthey (UK), and Haldor Topsoe (Denmark) develop metal catalysts specifically for fertilizer production, wherein iron catalysts are the most preferred ones among ammonia fertilizer manufacturers. On the other hand, nickel and vanadium are widely used for sulfuric acid production in the Asia Pacific region. Raw materials occupy over 70% of the production cost, and since ammonia and phosphate fertilizer production is major in Asian countries, considering the developing economic conditions of these countries, cheaper catalysts would be opted to stabilize the fertilizer cost. Hence, base metals are expected to maintain their dominance at a higher CAGR during the forecast period. According to FAOSTAT, of the total nutrients consumed as fertilizers across the globe in 2016, over 70.7% were nitrogenous nutrients. In comparison to phosphatic fertilizers, ammonia and urea production has been growing at a higher rate in the Asian countries. Also, with the increasing emissions from ammonia plants, emission control catalysts are being highly sought to meet the government standards in the market and hence, the nitrogenous fertilizers segment is projected to grow at a comparatively high CAGR during the forecast period. Asia Pacific is projected to witness the highest growth in the catalyst fertilizers market during the forecast period. With the growing population in countries such as China and India, the demand for food products continues to grow each year in the region. To meet this challenge, it is necessary to increase crop production, which relies on the fertilizer industry. The Asia Pacific market for catalyst fertilizers is driven by the rising need to increase crop yield and growing production of fertilizers. The growth in the production of fertilizers is mainly due to the increase in the consumption of fertilizers and support from the governments to increase the production. The growth of the Indian catalyst fertilizers market is driven by new installments and upgradation of ammonia plants, with respect to natural gas feedstock, and government support for fertilizer production through subsidies. There are many local and global players who provide catalysts for different industry verticals, especially refinery and pharmaceutical industries that hold strong demand for these catalysts. Multiple companies are major suppliers of catalysts in more than one industry, and hence, the end-use applications for their products are not mentioned. Hence, the scope of this report includes a detailed study of only those catalyst manufacturers whose portfolio mentions the end use as fertilizers, such as Clariant International (Switzerland), DowDuPont (US), Project & Development India Ltd. (India), Johnson Matthey (UK), Haldor-Topsoe (Denmark), LKAB Minerals (Sweden), N.E.Chemcat (Japan), QuantumSphere Inc. (US), Quality Magnetite (US), and Oham Industries (India). 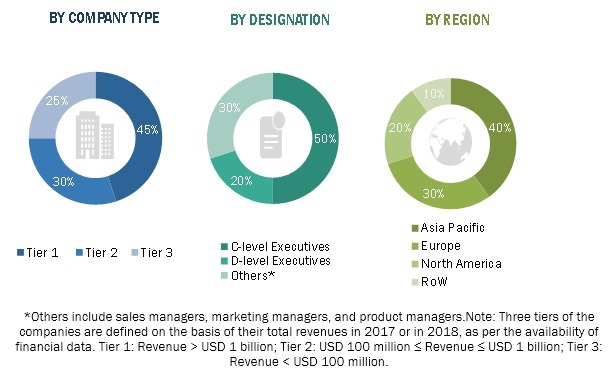 Various strategies such as joint ventures, supply agreements, and new product launches were adopted by companies, to enter the catalyst fertilizers market. In December 2018, LKAB Minerals acquired Francis Flower (UK), a mineral ore processing company. The acquisition would help both the companies to strengthen their product portfolio and global reach. In November 2018, Haldor Topsoe (Denmark) opened its new office in Jakarta, Indonesia. Due to the expected high demand for ammonia in Indonesia, the expansion would help the company to reach the customers effectively. In September 2018, Haldor Topsoe (Denmark) entered into an agreement for an 11.7% stake in the Indian fertilizer plant in Ramagundam, Telangana. The agreement was done in collaboration with the Danish government-owned Danish Development Finance Institution (IFU) and The Danish Agribusiness Fund (DAF). 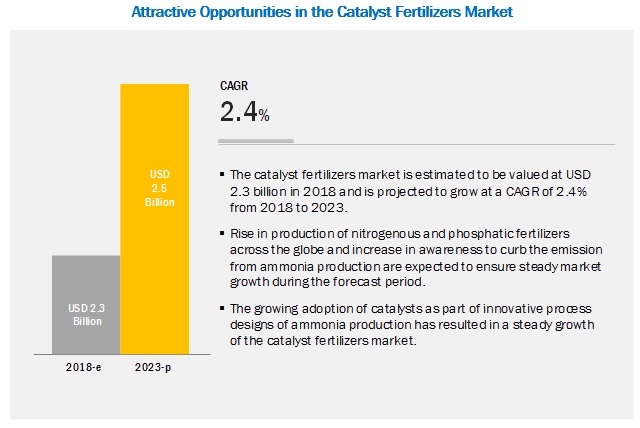 How would the catalyst fertilizers market be dependent on the fertilizer industry and which fertilizer production processes adopt maximum catalysts? Which region will hold the largest share of the catalyst fertilizers market? Which catalysts have high demand in each key country-level market? What are the trends and factors responsible for influencing the adoption rate of reforming/emission control catalysts in key emerging countries? What is the level of support offered by governments to manufacturers to adopt these technologies? The study includes four major activities to estimate the current market size for catalyst fertilizers. Exhaustive secondary research was done to collect information on the overall market and the peer markets. The next step was to validate these findings, assumptions, and sizing with industry experts across the value chain through primary research. Both top-down and bottom-up approaches were used to estimate the complete market size. Thereafter, data triangulation was used, and the market breakdown was done to estimate the market size of segments and subsegments. In the secondary research process, various secondary sources were referred to, to identify and collect information for this study. The secondary sources included annual reports, press releases and investor presentations of companies, white papers, certified publications, articles from recognized authors, gold & silver standard websites, regulatory bodies, trade directories, and databases. Secondary research was mainly used to obtain important information about the industry’s supply chain, the market’s value chain, key players, and the market classification and segmentation according to the industry trends to the bottom-most level, and geographical markets. It was also used to obtain information on key developments from a market-oriented perspective. The market comprises several stakeholders in the supply chain, which include metal/mineral ore suppliers, chemical solution providers, catalyst manufacturers, fertilizer manufacturers, and related organizations/institutions. Various primary sources from both the supply and demand sides of both markets were interviewed to obtain qualitative and quantitative information. The primary interviewees from the demand side include key opinion leaders, executives, vice presidents, and CEOs of companies producing fertilizers. The primary sources from the supply side include catalyst membrane designers, R&D institutions and organizations, and key opinion leaders. All the possible parameters that affect the markets covered in this research study were covered in extensive detail, verified through primary research, and analyzed to obtain the final quantitative and qualitative data. Research included the study of reports, reviews, and newsletters of top market players along with extensive interviews for opinions from leaders such as CEOs, directors, and marketing executives. After arriving at the overall market size from the estimation process explained above, the total market was split into several segments and subsegments. In order to arrive at the exact statistics for all segments and subsegments, the data triangulation and market breakdown procedures were employed wherever applicable. The data was triangulated by studying various factors and trends from both the demand and supply sides. Along with this, the market was validated using both top-down and bottom-up approaches. This research report categorizes the catalyst fertilizers market based on fertilizer application, metal group, fertilizer production process, and region.